Our weather forecast today in Beqaa Valley, Lebanon calls for 100% snow the next 24 hours! 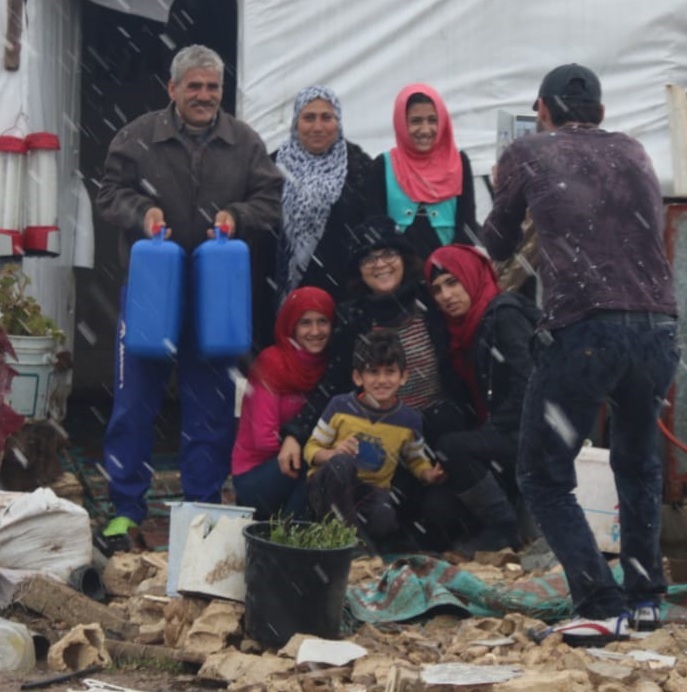 Just before the snow started to fall, my team and I rushed to the Syrian refugees’ camps distributing basic necessities but most importantly heating fuel. It is estimated the temperature will reach -4 Celsius (24.8 F) this week. Imagine living in a shanty tent in such cold weather. As we were walking from one tent to another, we met one of our students, Jaber, pictured here. Jaber studies at our educational center because he was not accepted at any school in the area. We were shocked when we saw Jaber shivering from the cold with no hat and jacket to wear. It was also surprising for us that although we gave Jaber a hat and a jacket at the start of winter, he told us that he does not have them anymore. Upon further investigation, we learned that his mother is selling Jaber’s clothes. This is terrible! However, when you hear that his father is disabled and cannot earn any money and that the mother is selling Jaber’s clothes to buy bread and cheese for the family, you have a different perspective on the suffering of Jaber and his family of nine members. Within a few hours, our Outreach Foundation office in Franklin, TN sent a wire of $5,000 to Izdihar, who was deeply grateful as it would allow her team to purchase more urgently needed items, especially warm coats and shoes for the children. We had those funds available because of your gifts. Long after most of the world has turned away from the “tiresome” problem of Syrian refugees, you “do not grow weary in well doing” (Galatians 6:9). You are meeting real human need. And those needs are being met though those who are not shy to name the name of Christ.